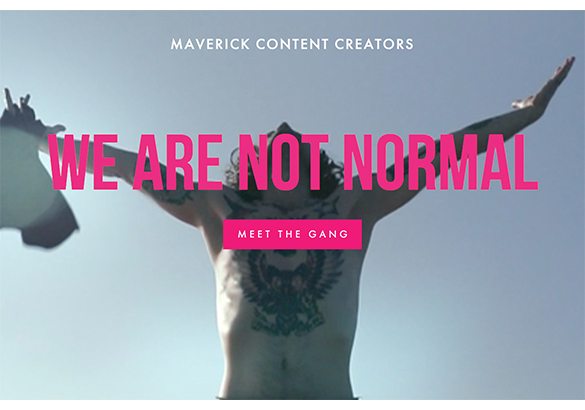 Thrilled to announce that we’re now represented by Not Normal Content. Written by Carson Ting. Posted on November 17, 2017. Filed under Blogging. Tagged artist, not normal content, representation. Comments Off on Thrilled to announce that we’re now represented by Not Normal Content..
We’re super stoked to have signed on with Not Normal Content as they’ll be representing us in the U.S., Mexico and Canada. We have a ton of new projects in the works that we’re excited to share once we settle back in Vancouver next month. Stay tuned for more updates! A modern day artist, he’s a designer, muralist, animator & art director all rolled into one. Boasting a signature style, he puts eye-catching designs on everything from walls to shoes to bikes. He’s hand illustrated an entire car and created animated characters with quirky on-screen personalities (a bit like his moniker Chairman Ting). 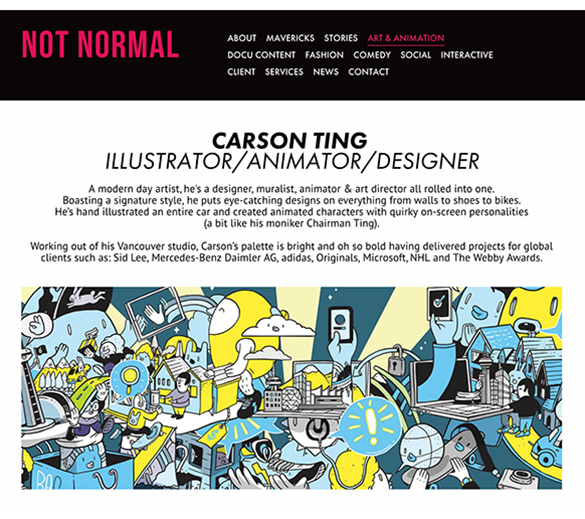 Working out of his Vancouver studio, Carson’s palette is bright and oh so bold having delivered projects for global clients such as: Sid Lee, Mercedes-Benz Daimler AG, adidas, Originals, Microsoft, NHL and The Webby Awards. New Work: Illustrating type for the Vancouver Aquarium. Five fresh enamel pin designs for Nike’s Air Max Day 2019. From lost Intern to full time studio manager in 9 months. 2019 Applied Arts Photography & Illustration Awards Winning Entries. Black Bean design agency’s mural: An illustrated map of Kelowna. © Chairman Ting Industries | An experimental visual workshop | All Rights Reserved.